Verta, Inc. announces formation of Midwest-based architectural coating business Verta, Inc.
DELANO, Minn.—Verta, Inc. is excited to announce its official launch as a high-performance architectural metal coating finisher serving the Midwest and beyond. The company, established in 1985 under another name, has been the exclusive finisher for its sister company, Industrial Louvers, Inc.
Verta is a certified applicator for Valspar and PPG aluminum extrusion formulations. Verta’s standard finish is Valspar’s Fluropon® Pure line of coatings. Formulated without the use of perfluorooctanoic acid (PFOA), hexavalent chromium, cadmium, lead, phthalates and other hazardous materials, these coatings were created with material transparency and environmental impact in mind. Verta is the first company of its kind to completely eliminate all types of chromium from its processes without sacrificing quality. After extensive testing, Verta’s chrome-free pretreatment process has proven as effective as hexavalent chromium and more effective than trivalent chromium. All coatings carry a standard 20-year warranty. Verta illustrates its commitment to sustainability throughout all of its operations. Its state-of-the art facility and new paint line feature high-efficiency ovens that use a fraction of the energy of traditional ovens. The wash system will use rainwater captured from the building’s roof for the wash process, reducing the amount of water used and processing required to pretreat water for the system. Water is filtered and recycled multiple times through the five-stage wash process, minimizing the amount of fresh rainwater required to fill the system. The company’s new facility was designed and built to be ready for photovoltaic panels in the future. All of these innovations contributed to sister company ILI’s achievement of the International Living Future Institute’s Living Product Challenge Petal Certification. Sustainable practices are only one component of Verta’s continuous improvement and quality efforts. With more than 30-years’ experience in packaging complex, custom architectural metal products for ILI, Verta is uniquely positioned to handle large and complex finishing projects. 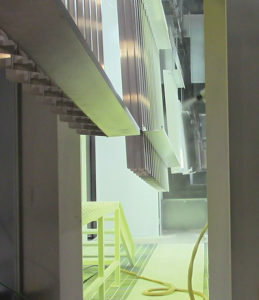 Extrusions and sheets up to 2 feet wide by 6 feet high by 20 feet long can be processed with a standard setup. Larger sizes are also possible with special setup.